Are you unsure of your life's purpose? Are you afraid you're living below your true potential? Do you have trouble staying motivated and focused on your goals? If you answered yes to any of the above, this book is for you. 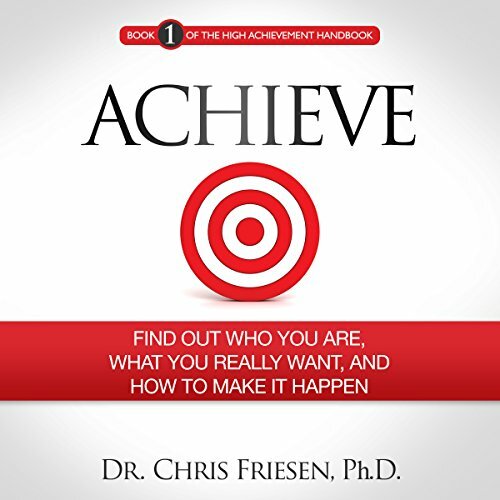 Dr. Friesen pulls from his work with high achievers, his own personal experiences, and his vast knowledge and experience in the field of psychology to build you a roadmap to elite achievement. This scientifically packed and highly practical book is going to show you, step by step, what you need to do to make sure you're working effectively toward the dreams and goals that are right for you. Whether you're an elite athlete, entrepreneur, executive, professional, writer, or high achiever of any type, this book is for you. Learn how your unique personality is the foundation for your success. Quickly find out what's really important to you. Unleash unique strengths and passions that will be key to your success. Unveil the mission and purpose that will propel you forward. Learn how to set, and finally achieve, the right goals for you. Are you ready to take your life to the next level? If so, let's do this! If I heard one more reference to"the other books in the series" I was going to scream! Or go to www.friesman.......argh!!!! Thought, sensible, science based advice on setting and reaching the right goals. No hype whatsoever. This book is NOT another bland rehash of old material! I was blown away by the degree to which Chris Friesen helps the reader dissect his/her personality tendencies. By scoring yourself (my wife and I helped score each other) in regards to five distinct tendencies you not only end up with a new perspective on yourself, but you are also able to immediately use that newfound knowledge to start modifying behaviour. It all made so much sense! This is a self help book that you can actually use to help yourself! This is NOT another bland rehash of opinion and conjecture. This is an impressive book produced by a results-oriented author. Chris Abell delivers the material crisply and clearly. He sounds enthusiastic about the subject matter. Once I got into the personality tendencies section of the book I realized I was listening pretty enthusiastically! I can't wait to listen to the next book in this series. Where does Achieve: Find out Who You Are, What You Really Want, and How to Make It Happen rank among all the audiobooks you’ve listened to so far? This audiobook is more relevant and applied than most of the other self improvement audiobooks I've listened to. The integration of personality traits with self-help strategies is excellent and leads to better and most lasting outcomes. Loved the narrator and the personal touches and humour. Second half is great, first half is undermined by marketing. The latter half of this book contains useful, actionable, and science back information. You'll surely feel motivated to take the next steps towards fulfillment after listening. Unfortunately, the first half of the book will put a bad taste in your mouth as the author constantly refers to "find out more in the other books in this series". This wouldn't be the worst thing ever if it wasn't done to the point of leaving out large swaths of information and supporting evidence for the authors claims. A cheap marketing trick that could have easily been avoided be adding another few chapters to this book. Please write more books, you're a knowledgable author, but don't ask the reader to buy your work at the end of every single subsection in the entire first half of your book. Maybe wait for this one to be on sale. A well put together book, narrated in a clear way. You’re given actionable and useful tools for self-improvement, and learning more about yourself. Excellent and very exhaustive work capable of helping anyone regardless of their situation. Looking forward to additional volumes. With the promise of future books, and hopefully Audible versions as well, Dr Friesen has provided a good start for anyone seeking success. I would have like the answers to some of the questions he raised, but promises to address in the future. Nevertheless, enough useable info made this a good listen. TARGET AUDIENCE: Self-improvement book based upon sound clinical research, combined with real world experience. This is not a “motivational” book by a someone who has made it big and is just cheering you on, but based on proven techniques. If you like Steven Covey, Dave Ramsey, or Viktor Frankl you will love this book. NARRATOR: Excellent. The book was well read, and added to the book. OVERALL: Absolutely recommend this book. Would you consider the audio edition of Achieve: Find out Who You Are, What You Really Want, and How to Make It Happen to be better than the print version? It is a delight to listen to the process. I can be running and listen to it. I would advice you to get your copy. What does Chris Abell bring to the story that you wouldn’t experience if you just read the book? Chris Abell add the hypnotizing voice that keep your attention all along the book. It touched my emotion and make me realized that I have to do more physical activities and in a proper way. What made the experience of listening to Achieve: Find out Who You Are, What You Really Want, and How to Make It Happen the most enjoyable? The author gives some new ideas and perspectives. There are several personality factors that really determine how you should attack certain situations. Chris does a good job of making sure you are lined up to think about a situation correctly. What was one of the most memorable moments of Achieve: Find out Who You Are, What You Really Want, and How to Make It Happen? By far the section on Goals. The author does and excellent job of walking you through how to set AND achieve your goals. The section about figuring out what you really want was impactful. What insight do you think you’ll apply from Achieve: Find out Who You Are, What You Really Want, and How to Make It Happen? This book really made me re-evaluate how I approach my goals. I went our and bought a paper copy so I could take some notes. I liked listening to this on audio, because the narrator does a really good job. The only problem is there are several points when I wanted a paper copy to highlight and go back to. Overall this is a great book and I highly recommend it.